We have just reached the season of lent which may not be a calendar season but for all Christians has exceptional resonance as the build up to the most important date in the Christian calendar. The marketing man has woken up to yet another money making way of draining me out of my hard earned cash. Shrove Tuesday has always existed, the night before 40 days of abstinence. 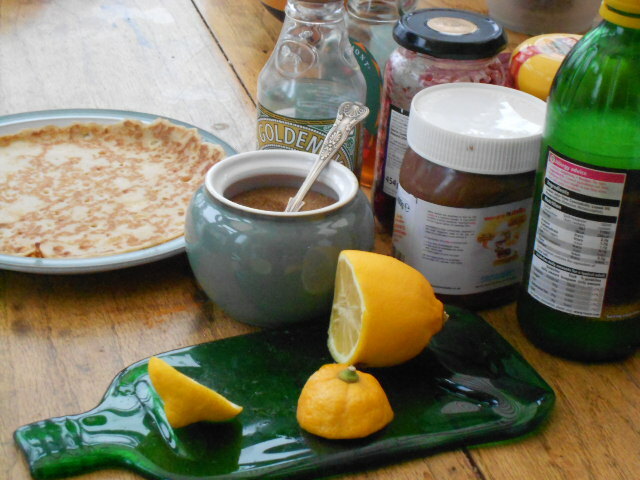 History tells us; everyday folk like you and me would clear out the larder and use up all the fat, milk, eggs before the onset of the family abstinence which did not allow such extravagances during the period of lent; hence the birth of pancakes. It is a funny concept as in those days fat, milk and other perishables probably wouldn’t last that long out of the fridge anyway. The name Shrove Tuesday is English, derived from the word shrive meaning confess. When this country was still religious; people would attend confession on the Tuesday in order to be cleansed of sin before the onset of their abstinence. Other cultures have taken the name fat Tuesday; Mardi Gras (French), Fettisdagen (Sweeden) and in Iceland they call it bursting day, Sprengidagur which conjours up all kinds of wonderful images of Icelanders rolling round the floor so full of pancakes they want to burst. Whatever we choose to call it, popularity has grown with all the ingredients displayed together at the end of the aisle. We are tempted to pick ingredients cleverly displayed together off the shelf and decide which fillings we want, also arranged temptingly close. Maybe it is time to treat yourself to a new pan. In the back of your mind you can nearly justify it, you have thought about replacing the old one before; last time you passed this display. Go on when did you last treat yourself. Well done, but what about the old jug at home although perfect for measuring the water needed last week; it is a little tired and faded. A nice new shiny clean one can read the measurements exactly and cause your pancakes to be such a success. Fantastic, your pancakes will be the best this year. I do have my own shriven to confess; I cheated and we bought readymade ones. Sacrilege! When you consider I also claim to write a food blog: http://tiggy-tea.blogspot.com/. Shop bought did not detract from the taste, nor from the array of different toppings but it did leave my kitchen ceiling unmarked with greasy stains and the old rickety pancake pan with the lop sided handle still in one piece, maybe next year it will be necessity rather than temptation that makes me buy another. It also left a relative calm around the table because although there was still fighting over who put whose pancake in the microwave, the resulting mess was negligible. Previously when everyone has to make their own pancakes; I will leave you trying to imagine the state of my kitchen. Lent itself is a time of fasting and abstinence; traditionally; going without the luxuries of fat, eggs, milk and abstaining from meat for 40 days. Modern times bring modern adaptations; people casually give up chocolate, alcohol and smoking which is challenging and stressful. I wonder though if the hardship it brings is comparable to previous generations or is restraint cultural rather than an understanding of the symbolism. I personally have given up giving up. There are many things I enjoy but nothing that would give me hardship or cause me to question my reasons by giving up for 40 days. I could give up wine, as I don’t really drink anything else. I realised that since my birthday in January I had only had one night of drinking when we were with friends celebrating the half term so I wouldn’t even notice I had given up. Chocolate seems to be a popular one and maybe I could consider this. I however don’t like chocolate, I buy it for the children and the husband but rarely eat it myself. I don’t smoke, and rarely eat bread unless I have made it myself. For the fourth or even fifth year I have taken on something and this year I am going to try and do an act of random kindness each day. Added to my kindness I am going to only see the good in people. This may not be the most obvious sacrifice and there will be no one to share with but it will bring me a lot of hardship; trying to see any good in some selfish acts. The act of kindness may be more visible to the person on the receiving end, but it will be seeing the opportunity and taking the courage to step out of my comfort zone to help a stranger or animal or even a friend in some tiny way. Already I am struggling with these particularly as my neighbour continues to drill right next door to me while I try to work..
No 1 Son has again given up milk although I am not sure for the right reasons. He is going through a completely atheistic phase of non-belief at the moment, as he is the only teenager in the whole world whose mother makes him go to church. His mother although hasn’t given up on him, has stopped nagging him, he now has to make his own choices. It does make me smile that he is so keen to give up something for lent, the Christian season of waiting and preparing. Maybe an act of kindness towards his siblings once in a while would be appreciated but I am probably expecting too much and acts of kindness should be left to me. At least I can see the goodness in his heart at trying to give up something for lent which I believe he will succeed at. I have been remiss again this week and not written much at all. The homework from the writing club was to take a break from the taboo relationship story then review it again with new fresh eyes. This is good advice and important but I do need to keep writing as well. I also need to chase up my other reviewers and amend memories accordingly before sending it out again.